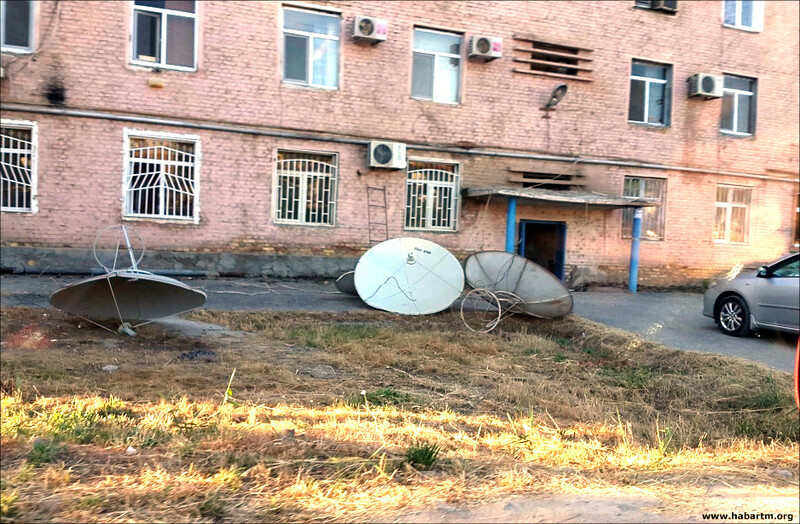 In Ashgabat, the campaign to dismantle individual satellite dishes from the facades and roofs of multi-storey houses has coming to an end. However, the ‘dishes’ remain popular throughout the rest of the country. In provincial towns and villages, even in auls completely fully consisting of jerry housing lost in Karakum dunes, each family has one or even two antennas rotated in the direction of the Yamal-401 and Hot Bird space communication satellites at a certain angle. TV viewers, sometimes not understanding a word on other languages ​​than native ones, nevertheless watch the programmes of Russian, Uzbek, Turkish, Chinese, European TV channels on a regular basis. Watching the ‘Echo of the Planet’ programme viewers can learn only about global events taking place in the world that cannot be hidden, and basically this information is positive and is taken from numerous world media. The rest of the information programmes broadcast about Turkmenistan's domestic achievements; they tell about ‘labour victories’ enthusiastically, with aspiration, voice accent is made even on simple numbers, apparently to impress viewers. At the same time, viewers will not learn anything new, almost the same information sounded yesterday, and the day before yesterday, and a month, and even years ago. And so every day, from 6 am to midnight until the final release of the ‘Watan’ programme broadcasted by three TV channels at the same time. 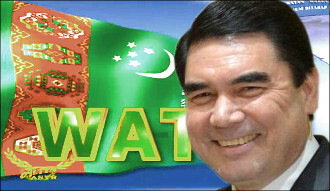 All events taking place in Turkmenistan are linked only with Arkadag. Every TV plot sounds like: the leader of the nation, the esteemed president, our hero and Arkadag Gurbanguly Berdimuhamedov visited, reviewed, instructed, created, presented, fired, initiated, showed concern, became the first at the races, etc. Only ‘Miras’ TV channel selectively broadcasts entertaining programmes of Russian TV. There are no debates, heated disputes, clashes of different opinions on Turkmen TV. If there are more than two participants in the studio, then, as a rule, one speaks and the other listens. Faces look tense, as well as their figures: straightened backs and perfect postures. According to one member of the Yashlyk TV channel telling confidentially about the rules of the channel no speech on live broadcast is allowed, the viewer gets everything recorded and passed through a three level censorship. The first stage is the self-censorship of the TV presenter or the reporter involved in the production of the programme. Then the footage is checked by the editors - the editors, the programme director, the vice-chair or even the chair of the TV channel himself. 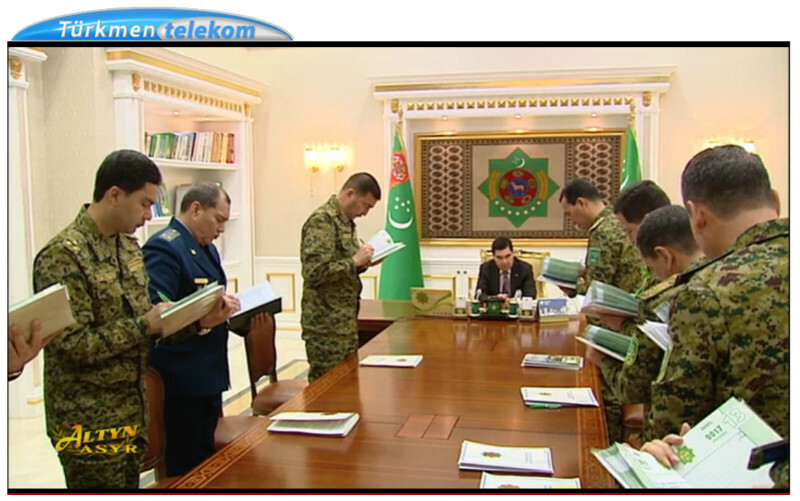 Finally, the material ready for airing comes to the representative of the State Committee of Turkmenistan for the protection of state secrets in the media. If some of them at some stage have remarks on the content of the programme as a whole or to any word, gesture, studio design, behaviour of participants in the studio, everything returns for revision or even for reshooting. ‘No other name shall eclipse Arkadag, only one name and one surname - Gurbanguly Berdymuhamedov shall sound’, ‘Yashlyk’ employee said, ‘this is a demand from above.’ Names of officials like vice-premier or foreign minister mentioned only once in TV programmes; further their posts only. During ten years of his presidency Gurbanguly Berdymuhamedov expressed many times his discontent about the shortcomings in the work of national mass media. Very often the object of his criticism is television. Every time, publicly criticising the vice-premier who is in charge of the culture and media, dismissing next head of state media, Mr Berdimuhamedov complains that the quality of publications, TV, and radio programmes remains low, boring, and uninteresting. However, he has never demanded during ten years to stop or at least slow down efforts glorifying his person and praising his activity at the presidential post. Songs on the ‘Turkmen Ovazi’ TV channel in the Berdymukhamedov ‘Era of Power and Happiness’ sound exactly the same as they were in the Niyazov ‘Era of the Golden Age of the Turkmen people’. Gurbanguly Berdymukhamedov himself already outperformed his predecessor in the number of songs written about him. Out of seven Turkmen TV channels only the ‘Sport’ channel has not been mentioning the name of the Turkmen president so often. But in April 2017 the president dismissed its director for not managing his duties well. Atajan Nepesov (pseudonym of the Turkmen journalist in exile). 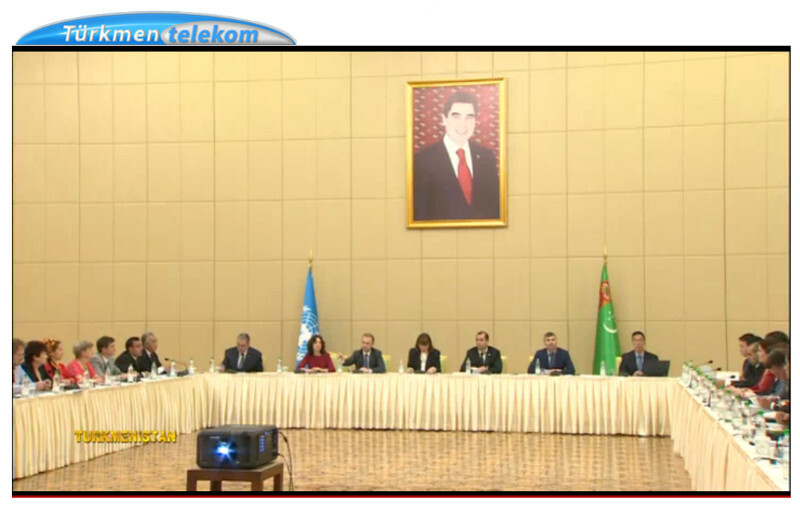 The article uses screenshots of various channels of the Turkmen television available online.